Bio Thala prickly pear vinegar (opuna ficus indica)is manufactured using a natural process without any chemical additives or accelerators. The collected fruit juice begins a long process (up to one year) of fermentation. The fermentation is done by itself in pottery jars to guarantee an irreproachable quality of the vinegar thus allow the formation of the precious Mother of Vinegar one of the most beneficial natural substance of World. -Our Precious seeds is rich in essential fatty acids which help to fight the free radicals responsible for cellular aging. It helps to protect the epidermis from external aggressions. Its richness in Essential Fatty Acids, Phytosterols, and Vitamin E gives it an interest in for protection and against inflammations of the skin. .
– This very rich firming mask helps you to keep skin youthful and toned. 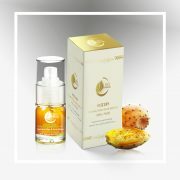 It regenerates your epidermis and effectively protects it from aging. Soft and effective, its application is a real relaxing moment.